Te sekwencje 3D - meh. Kolorystyka dziwna i psychodeliczna. Pędzlowanie przypomina mi... Sunshine. Ale czarno-biała sekwencja na statku -- miazga. O ile reszta mnie nie ruszała, to nakręciło mnie maksymalnie. Rzekomo to jest oficjalny boxart ggry. Epic. Dokładnie. Wszędzie gdzie dziś Kox wpieprzał fotki w swoich postach to tych fotek nie widać, OLO. Wydaje mi się, że mechanika w tym trójwymiarowym świecie będzie miała sens głównie w większych miejscówkach, których nie chcieli/nie mogli pokazać. gameplay był fajny, oby tylko gra była pozbawiona loadingów i można kupować. Loading był widoczny, ale króciutki (ze 3 sekundy?). Jeśli tak chodziło z nośnika a nie z dysku w devkicie to powinno być IMO ok.
ja mam niesmak po sekcji 3d więc dopóki nie zobacze czegoś co go zatrze nie będę wiązał nadziei z tym tytułem. jedno jest pewne, gra ma niesamowity potencjał ze wzgledu na multum licencji jakimi moga operować developerzy, oby tego nie zj***li. To obiecał Warren w prezentacji dla Gejpłotu, w obecnej wersji są loadingi, ale ich nie będzie, kiedy skończą grę. Warren prezentuje grę. Dużo gameplayu. Miód. Obadałem Stage Demo z Warrenem na GameSpocie i konkretnie napaliłem się na tę grę. Spodziewałem się platformówki z zacnym designem, otrzymałem coś znacznie bardziej rozbudowanego. Szykuje się genialna szpila, nawet, jeśli wygląda przystępniej (tj. mniej mrocznie) niż to zwiastowała okładka GameInformera. 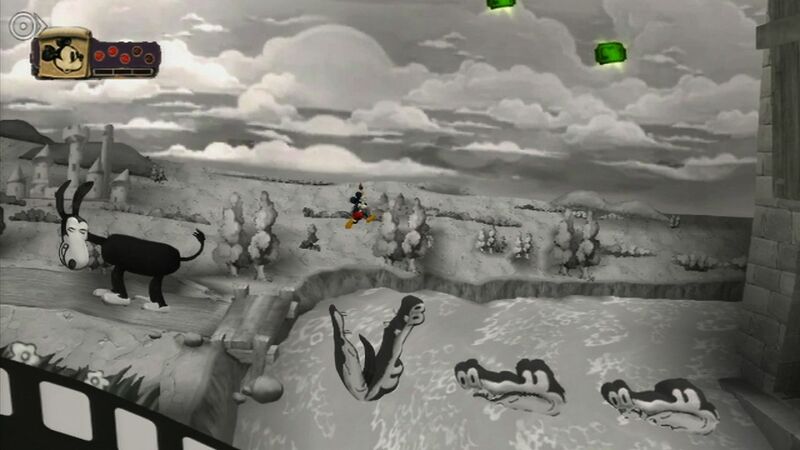 Eurogamer: Epic Mickey was, for some, the game of the show at E3 2010. How does that make you feel? Warren Spector: It's phenomenal. Making games is gruellingly hard work. People think it's all fun and games. It's really painful a lot of the time. Really long hours and really high stress and lots of pressure - and then you throw in the fact that you're making a game that stars the most recognisable icon on the planet. The added pressure of working with a character that is as beloved and as well known - even if you don't love Mickey you know him and you have an opinion about him - it's like a pressure cooker. You get so close to the work. We live with this thing for 10, 12 hours a day, six, seven days a week for years. That's literally what we're doing. When you're head down and grinding away at making fun, you don't know what you have. So, to take it out in public for the first time and get the kind of response we got, it was incredible. When we were at the show, actually, early on - I brought about 15 people from Junction Point out to do the demos - and everybody was getting really excited. I was going, "Yeah this is really cool. This is reminding me a lot of Deus Ex." People really loved it and you could tell and it was so exciting. By the end of the show, this had far outstripped Deus Ex. I've never been associated with anything that was as... I don't know. The buzz was so great. The key thing - and I keep telling the team this - is, eyes on the prize. Keep your eye on the prize, because we have to make it the game of the year, damn it. You can't believe all the great stuff. You got to take it and enjoy it and revel in it, which, believe me, I am. And then go and do even better. Eurogamer: I know you like your films. What's your take on Roger Ebert, who said videogames will never be art? Warren Spector: You're trying to get me in trouble, aren't you? Eurogamer: As someone who's making a game with a distinctive art style, it would be great to know what you think about the games are art debate. Warren Spector: That's another one where I almost don't care. If we haven't already won, we're inevitably going to win. Videogames are just coming out of the period where I describe them as the medium adults don't get. Roger Ebert is like the adult. He doesn't get it. The fact is if we haven't already reached the point where this is true, we're very close to reaching the point where everyone plays games, in the same way that everyone goes to the movies and everyone watches television. We're really at that sort of point where everybody plays games. As younger people grow up and as twenty-somethings have kids and they start gaming - it's not like the twenty-somethings are going to stop playing games when they get to 30, 40 and 50. We're becoming a mainstream medium where everybody plays. Eventually, some other thing will come along that I don't get or you don't get and we'll all say, "Oh, those kids today, that stuff isn't art." The same thing happened with movies. Go back to the early days of movies. Go back to the early days of the novel, for crying out loud. That can't be art. Go back to the days when people gave Shakespeare a hard time. Whatever medium adults don't understand can't be art. Eventually those adults go away and new adults take their place, and some other medium takes the place of the thing that everybody hates. We're coming out of that period now. What Roger Ebert thinks is completely irrelevant. Eurogamer: You've said that you've got another two Epic Mickey games planned in your head. Have you had any luck signing them off, or do you have to wait to see how Epic Mickey does first? Warren Spector: I don't know if it's how Epic Mickey does, but it's certainly how Epic Mickey finishes. We're working very hard. I want to get this one out of the way before we start thinking too much about what comes next. But I've got some ideas. If Disney say they want it I think I can take care of them. Eurogamer: Would you prioritise Epic Mickey over Duck Tales, which I know you love? Warren Spector: Why can't I do both? Eurogamer: I don't know. Why can't you? Warren Spector: You know, we'll see. I don't know. It all depends on what Disney wants to do and how this game does. We'll see what happens after that. First, let's get this one out. Intro wygąda ślicznie, pytanie tylko na ile to real-time a na ile sztuczki grafików dające taka iluzję, bo już gameplay tak nie powala. 5 rzeczy, które nie odpowiadają IGN AUS - nie napawa to optymizmem. Ten artykuł idealnie opisuje moje wrażenia po zobaczeniu dema z E3. Nudny gameplay, słaby design poziomów, grze brakuje charakteru. I dosyć już mam gadania o "świetnej grafice... jak na Wii". Wygląda to zwyczajnie słabo i tyle. BB mowil w EF o jakiejs limitce... czemu jej wiec nie ma? To jakas limitka nie do kupienia? Who knows wtf? Tak samo myślę, nie rozumiem tych wszystkich haseł jaka to niesamowita gra nam się szykuje, mam wrażenie, ze ludzie podłapali hype (zaczęty zresztą od gołych artów/szkiców w game informerze...) a gra bardziej stoi tym co obiecują twórcy niż tym co pokazali...obym się mylił, bo cholernie chciałbym aby ta gra jednak sie udała. O Bioshocku też swego czasu można było to powiedzieć (E3 2006), ale renoma twórcow + obietnice + parę naprawdę fajnych rzeczy, jakie zobaczyliśmy na E3 (serio, ta gra miała zajefajne prezentacje i nie jest brzydka) moim zdaniem spoko wystarczają do tzw. "podjary na maksa". Czy się spełni, to zobaczymy. Nie zgadzam się, przynajmniej w moim odczuciu Bioshock już po 1szej prezentacji pokazywał ogromny potencjał. Prezentacja Mickey moim zdaniem taka nie była. A wy mówcie co chcecie, ja czekam na ten tytuł z niecierpliwością bo zapowiada się strasznie ciekawie, i raczej nie powinni go skaszanić . Coś ciekawego się w nich dzieje?